Lightning makes a dramatic background and slows the rollout of space shuttle Discovery to Launch Pad 39A at NASA's Kennedy Space Center in Florida on Aug. 4, 2009. First motion of the shuttle out of the Vehicle Assembly Building was at 2:07 a.m. ET. 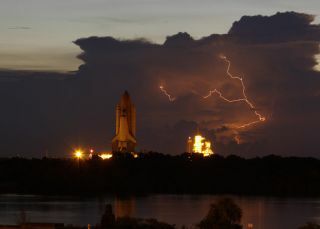 The spaceshuttle Discovery rolled out to its Florida launch pad Tuesday in an arduous, slow trekmade even slower by brilliant lightning flashes and soggy mud. Engineers began moving Discovery out to the seaside Pad 39A at NASA's Kennedy Space Centerbefore dawn Tuesday to begin priming the shuttle for its planned Aug. 25 launchtoward the International Space Station. Distant lightning lit up the sky abovethe Cape Canaveral spaceport, providing a stunning backdrop for the shuttle?splodding move. The tripnormally takes about six hours, but weather-related concerns pushed Discovery?sslow move beyond the 11-hour mark. NASA initiallydelayed Discovery?s trip by nearly two hours in order to keep shuttletechnicians inside and safe from potential lightning strikes at the launchsite. By 2:07 a.m. EDT (0607 GMT), it was safe to begin moving Discovery but stickymud from recent thunderstorms forced engineers to stop repeatedly to clean thegiant treads of NASA?s 5.5 million-pound (2.4 million-kg)?Apollo-era crawlercarrier vehicle that hauls shuttles out to the launch pad. ?We hadtorrential rain here yesterday evening,? NASA spokesperson Allard Beutel toldSPACE.com from the spaceport. ?It rained for hours ? so it was pretty soggy.? Despite thelightning and mud delays, shuttle technicians were more concerned about movingDiscovery to the launch pad ahead of stormy weather that was expected to hit thespaceport Tuesday afternoon. A talllightning mast and shell-like protective structure at the launch pad can guardshuttles against lightning and stormy weather, but the spacecraft and theirsupport crews are exposed to the elements when they make the short 3.2-mile (5-km)trek from NASA?s massive Vehicle Assembly Building and Pad 39A. Bolts of lightning struck11 times near the shuttle launch pad last month, causing one of a series of delaysfor Discovery?s sister ship Endeavour. That shuttle ultimately launched to theInternational Space Station on July 15 and landed July 31. Commandedby veteran astronaut Rick Sturckow, Discovery is slated to fly a 13-daymission to replace one member of the space station?s six-person crew anddeliver new supplies and experiments. Three spacewalks are planned to upgrade thestation?s cooling system and European Columbus laboratory. The shuttlewill also deliver the station?s new COLBERT treadmill, which is named aftercomedian Stephen Colbert, when it arrives at the space station. Sturckowand his crew will arrive at the Kennedy Space Center Wednesday to begin athree-day training session that will end with a launch dress rehearsal and shuttleescape drill on Friday. Meanwhile, shuttle engineers plan to replace afaulty valve on Discovery?s left solid rocket booster over the next week. ?We have nomargin, no cushion, in the schedule at all,? said Beutel, adding that there isa possibility Discovery may be ready to fly on Aug. 24. NASA hasuntil Aug. 30 to launch Discovery before it would stand down to late Septemberdue to a conflict with a new Japanese cargo ship test. Japan?s first H-2Transfer Vehicle, an unmanned space freighter, is slated to begin its maidenflight to the space station on Sept. 10. Video - Shuttle Escape Drill: Danger at the Pad!